This seems to be OK to me, as Dia is Suggested by the Inkscape package, because it adds additional exporting functionality to inkscape, thus is an Add-On to Inkscape. The Software Center explicitly states that a package suggested by another one should be treated as an add-on package of the package suggesting it. See https://wiki.ubuntu.com/SoftwareCenter#Add-on%20packages. Ahh... fair enough. Marking as invalid. Inkscape provides an extension "dia.inx" that allows Dia files to be read by Inkscape. It is only enabled if dia is installed. I think "Suggests: dia" is fine here, because it adds extra functionality to Inkscape. I can't see an obvious reason for "Suggests: skencil". The import/export extensions don't require it any more. "Suggests: python" is also clearly not needed. The "Recommends: python-*" explicitly list all non-standard python modules that would normally be needed for Inkscape extension scripts. summary: - USC shows Dia as a addon to Inkscape. How come I'm still seeing this in a fresh install of Ubuntu 12.04? 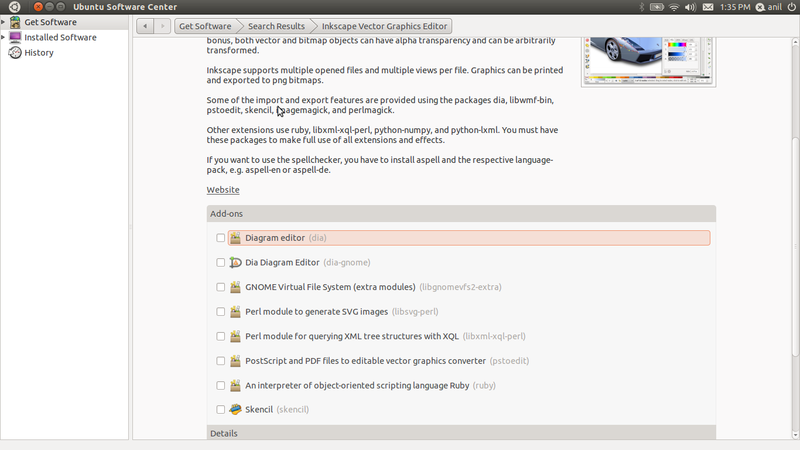 I've got the default install in Ubuntu of Inkscape 0.48.3.1 r9886 which is older than the closure of this bug. What's going on? Sorry, ignore my comment, I was frustrated about Dia being in there as an add-on but can see in comment 5 that this is consistent with ubuntu policy. Sorry for the noise.